The main conclusion of the Federal Reserve's policy meeting on Wednesday is forgone for most of Wall Street. The Federal Open Markets Committee, which started its two-day gathering in Washington on Tuesday, is expected to leave its benchmark interest rate unchanged. The clearest preview of Wednesday's likely decision came from Fed Governor Lael Brainard in a speech last week that warned against raising interest rates too soon. "Today's new normal counsels prudence in the removal of policy accommodation," she said in Chicago, adding that the case to raise rates is "less compelling." Brainard was not reflecting the views of all her colleagues on the FOMC, but her speech contained some of the reasons that could be cited for the Fed's patience. For instance, even with all the Fed's optimism about the labor market, Brainard pointed out that labor utilization is not yet at a point where it's putting significant upward pressure on inflation. Also, Brainard said neutral real interest rates are likely to stay very low for a while, symptomatic of continued sluggish economic growth. And, as Fed Chair Janet Yellen has mentioned before, the risks of raising rates too quickly are higher than those of being patient. That's partly because the Fed doesn't have much room to cut rates lower in a downturn. There's also the idea that the 'neutral' interest rate — consistent with the economy improving in line with its potential — is likely to remain low amid sluggish growth. Estimates of the neutral rate, like that derived from the Laubach-Williams model, suggest that the rate is about zero, versus potential growth of 1.5%, Nomura's Lewis Alexander said in a note. "In other words, the slow pace of growth in recent quarters undermines the argument that the FOMC needs to raise rates in the very near term in order to shrink a very large gap between actual interest rates and their 'neutral' level, Alexander said. There are other reasons Yellen may cite in her press conference after the statement is released at 2 p.m. ET. Economic growth improved in recent months. But in the last two, data on consumer spending and the manufacturing sector were less than encouraging. The Fed is likely to skip raising rates at its November meeting, even though it is after the election, likely because there's no scheduled press conference or updated dot plot that shows members' forecasts for future rates. That leaves December on the table for the Fed to enact its earlier forecast of at least one rate hike in 2016. "It would be really interesting to see the dot plot again because if the majority are saying "we're going to go one more time here," they have to go in December just to keep their credibility going," he told Business Insider. 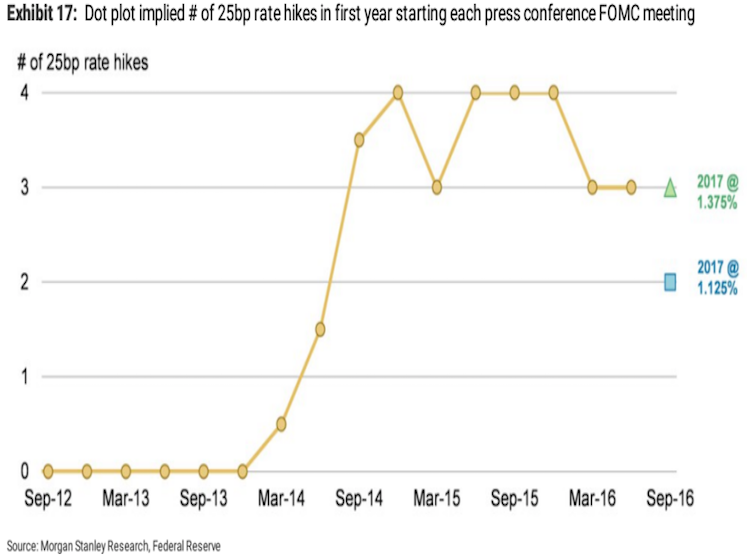 Notably, the dot plot is not a promise from the FOMC, but a charting of where members think rates should be in the future. However, it's often viewed as the former. The real impact of higher rates would not be on the economy; another 25 basis-point hike would be a "tiny shade at the margin," according to North. It would really be about how financial markets and asset prices react, North said, given that low rates have helped stoke asset prices. And, several Wall Street traders, who were not working the last time the Fed raised rates, are apprehensive. The Fed's meeting also comes ahead of an election that's brought the future of the Fed, and of monetary policy, into focus. Last week, Republican presidential nominee Donald Trump said Yellen is keeping rates "artificially low to get Obama retired," suggesting that there could be serious consequences afterwards. Also, San Francisco Fed President John Williams said last week that it's time to start considering fiscal or other policies that would keep the economy stable.